The Harmony Foundation for Children exists to break down the barriers between need and assistance by providing direct financial support to at-risk or in-need youth whose record of personal responsibility, dedication and achievement is imperiled by circumstances or events beyond their control. In particular, the Harmony Foundation for Children works to enhance philanthropy and strengthen our sense of community by providing help to those underprivileged children whose own families cannot. To date, hundreds of thousands of dollars have been donated by the Harmony Foundation to deserving individuals and organizations. Bedroom, dining room, tea room, study and more; Ethan Allen furnishings. Proceeds benefit the Harmony Foundation. On behalf of the Flowery Community, especially the children, we would like to thank you for your generous donation to our school. By matching our Jog-A-Thon proceeds, the 5th grade class can participate in the Outdoor Education experience where they learn to appreciate nature while living in it. As part of the Ledson Harmony Foundation's committment to youth, Steve Ledson presented a check for $25,000 through Sonoma Jazz + for continued support of music in schools. Pictured at a recent ceremony are left to right: high schoolers Connor Martinelli, Kyle Magnani, Sonoma Jazz + producer Jim Horowitz, Sonoma Valley Unified School District Superintendent Pamela Martens, Steve Ledson and student Tyler Woods. Flowery School students ran 1240 miles collectively or 4340 laps around the school track to raise funds for the fifth-grade class to participate in a four-day outdoor education program at the Headlands Institute in Marin County. Students in an environmental literacy project called "SiteSeeing: Neighborhood Based Learning," join Kathy Swett, executive director of the Sonoma Community Center, and Steve Ledson, president of Ledson Enterprises and the Harmony Foundation for Children, which helped fund the program, partnering with the Sonoma Valley Vintners and Growers Alliance to make it possible. The Sonoma Community Center is sponsoring the program, which will be taught at Altimira and Adele Harrison middle schools, Sonoma Charter School, the Waldorf School and the Boys & Girls Clubs of Sonoma Valley. SiteSeeing is an interdisciplinary curriculum for middle school students that teaches them how to see, read and think critically about the built and natural environments. The intent is to empower youth to claim ownership of, and take responsibility for their communities. Pictured from left are participating students Maribel Campos, 11, from Altimira Middle School, Ismael Torres, 12, from Altimira, Rayza Virgen, 12, from Adele Harrison Middle School and Deanna Cobleigh, 11, from Altimira. The HFFC donated $25,000 to Sonoma Jazz + for the Music in Education Programs in the Sonoma Valley Unified Schools. 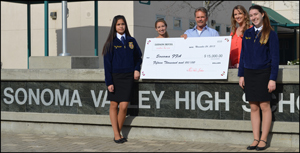 The HFFC donated $20,000 to the Anderson Valley Unified School District in Mendocino County. The HFFC ponied up a $20,000 matching grant donation to the Sonoma Charter School for the new barrier-free playground on campus. The HFFC donated $1,500 to the 5th grade class of Flowery School in Sonoma for a three day class field trip to the Marin Headlands Institute. The first grade classes of Prestwood Elementary School received $850 so the students could enjoy a field trip to the Marin Civic Center to participate in the Youth In Arts event.